On my recent trip to Europe, I was beautifully reminded that if you don’t really look closely at everything around you, you miss so much! The Gothic cathedrals are not just a wonder for their vibrant stained glass windows and the grace of their soaring heights, but the fabulous grotesquerie of their gargoyles and other statuary is always pure joy! These gargoyles range from the purely grotesque to the utterly whimsical to the rather obscene. But if you don’t look up and visually explore, you will miss them. By missing them, you miss a lot! 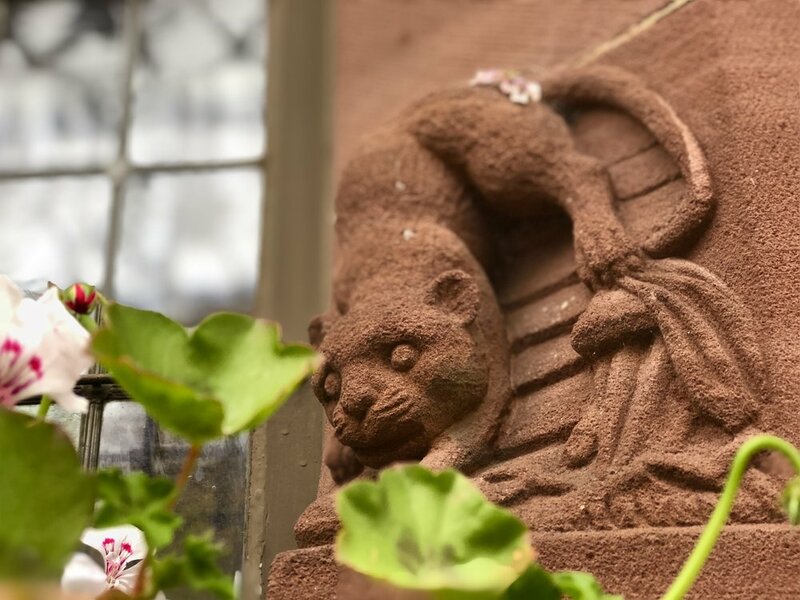 A few weeks ago, I was wandering through the Black Forest city of Freiburg enjoying the immense variety of architecture from centuries past, when I happened to look to my right and see this wonderful cat carved out of a deep red stone in a window sill. There it was, whimsically perched over a flower box filled with geraniums. I had to smile. That cat set me to looking at the other side, where I found this marvelous monkey. A monkey on a window sill! Fabulous! And that, of course, set me off to search out the rest of the window sills, where I found more fantastical carvings of people and animals. This little mini-exploration brought me so much joy — yet it also made me think. We have become such a distracted society. You cannot go into a public place without seeing half of the humans hunched over their smartphones (and I, to my great chagrin, am often one of them), not even paying attention to the person they are with, let alone their surroundings. Our surroundings have come to reflect this approach to life. You would be hard pressed to find many places where the architect or designer has created the kind of visual surprises that you find in architecture of another age. What a genuine shame that is! Visiting Europe and seeing the art and architecture reminds me that our “more” is certainly not always better. More as in progress and advancement and technology has led us away from the shared experience of buildings that collectively captivate us, art that is meant to make us look and think and feel deeply, spaces and places in which we become one in our experience of them. My favorite part of the tours that Peter Fuller and I create is that the people who join us are SO visually, aesthetically, culturally, historically and creatively curious. That day in Freiburg, I met up with some of our group after seeing my stone monkey and cat, and they rushed me over to the cathedral to see a wonderful 14th-century gargoyle mooning the square below. I had already visited the cathedral and yet had missed him entirely. What a gift to travel with people so eager to see and see deeply! But here, in the United States, our less is more mentality is really an oxymoron that impoverishes our lives. We don’t really want less, we want more more more disguised as the less of ease, the less of minimalism in service of capitalism, the less of isolation. That mentality has not only created a less visually interesting world all around us, it has created generations of less visually curious people. Less curious people in general. We have our routines and we live them out day after day, yet we wonder why our lives feel so barren. This is why I walk every day. And not just walk, but look. And look deeply. Because when I walk. there is always something new to see. But to really see, you have to not just walk, but walk with a willingness to become lost. To take a “wrong” turn and see where it leads you, to look all around you, to be present right where you are at the moment you are there — because we live in a transformational kaleidoscope that is full of color and wonder and joy, if we remember to look deeply. Because you can walk out without fear of really becoming lost, you can let yourself become lost in being present right where you are. Instead of letting your head guide you on your walk, let yourself be led by your heart. You may not see a five-hundred year old cat and monkey carved into a window sill, but you may see flowers you never bothered to appreciate fully, the color of a door that makes your heart smile, the leaves turning on the trees above you, and falling gently to the ground, the sound of birds singing, the feel of the wind against your face, the sweetness of fluffy clouds above. And when you do this, you will remember that this beautiful world in which we live has far far more to offer us that the minuscule screens into which we all find ourselves staring as though they can save our lives. These screens that promise us a false certainty are whittling away at our joy. If we are willing to open our hearts up to possibility and presence, to community and connection, to the joy of the journey and the invitation of the unknown, then and only then will we remember why we are here in the first place. As inspiration, I’ll leave you with the words of the poet who always inspires me to go out and see and truly be in the world every day — the wonderful Mary Oliver.